I'm not a fan of conspiracy (conspiracy theories), but in this disaster, there are some questions that have no logical explanation. The year before missing Malaysian Boeing, which is not found. Surprisingly, the two aircraft hull numbers are very similar: 9M-MRO (flight MH370, disappeared in March 8, 2014. 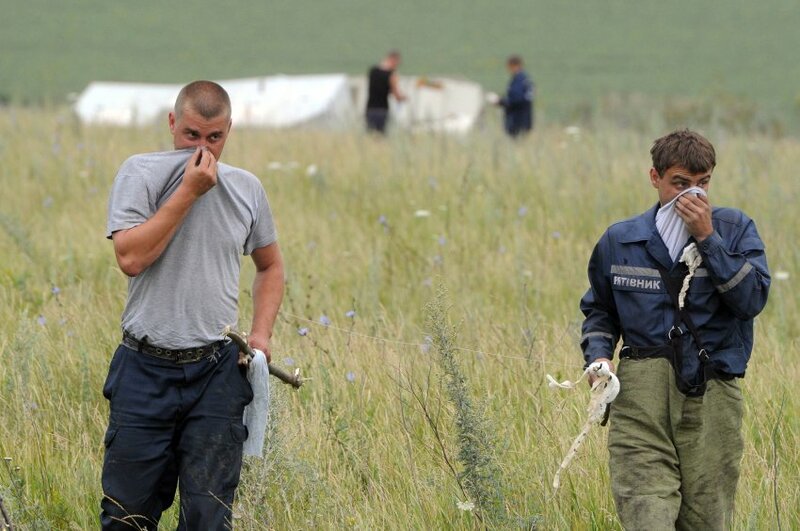 The wreckage of the aircraft were not found.) And 9M-MRD (flight HM17, shot down over the territory of Ukraine). Militiamen (the rebels) told that the corpses drained of blood and had a distinct smell of corpses. The body can not begin to decompose for half an hour, and even in cloudy weather. Many of the bodies were naked. And those who were dressed, wore clothes exclusively in Hugo Boss. For ethical reasons, I find it impossible to publish the photo. So just give links. Warning: do not look for people with weak mentality !!! In addition, the aircraft was found a large amount of medicine, blood serum and other things, which is not typical for conventional aircraft. European users did some own investigation. They tried to find these people in Facebook. It turned out that there were all the dead page, but all pages were opened on the same day (April 21, 2014) and were empty. However, I can neither confirm nor deny this information. Many passport had strange holes and cut parts.